An Illinois limited liability partnership is like a general partnership in that both business entity forms require more than one owner, but unlike a general partnership, a limited liability partnership offers all of the owners of the business limited personal liability for certain business debts. 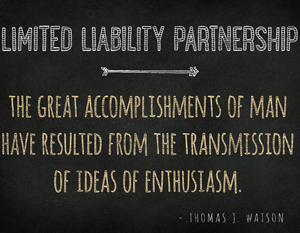 According to the Illinois Uniform Partnership Act (1997), a partnership may become a limited liability partnership. A limited liability partnership (LLP) is relatively easy to set up and is treated like a general partnership for tax purposes. This is one of the advantages of setting a partnership as a LLP: there is no double taxation like corporations are subject to double taxation. Certain advantages to the Illinois limited liability partnership business entity is that there is no double taxation and partners have limited liability in the partnership's obligations. The Uniform Partnership Act, 805 ILCS 206/306, provides that (a) Except as otherwise provided in subsections (b) and (c), all partners are jointly and severally liable for all of the partnership’s obligations unless otherwise agreed upon or provided by the law. Subsection (b) holds that a person admitted as a partner into an existing partnership is not personally liable for partnership obligations incurred before the newly admitted partner’s admission into the business venture. Subsection (c) provides that a partnership’s obligations incurred while the partnership is a limited liability partnership are solely the partnership’s obligation. A partner is not personally directly or indirectly liable, by way of contribution or otherwise, for those obligations simply because he or she is a partner.